Two grandfathers with a combined age of more than 120 have become the oldest pair to row across an ocean. Four Yorkshiremen have survived injuries, attacks by flying fish and a near-miss with a tanker to take fifth place in a 3,000-mile trans-Atlantic rowing race. 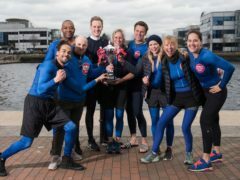 The BBC have seen off rivals ITV in a Sport Relief clash of the channels boat race. Aberdeen student Fiona Bell has taken a step closer to joining the GB Rowing Team. The final crews have been announced for the 22nd annual Aberdeen Boat Race.